Known as the “Mile High City,” Denver is hub to some of the best skiing in the country. It’s not uncommon to fly to Denver only to rent a car and drive right past downtown as you head to the slopes. But downtown Denver is definitely worth a stop. Revered as one of the greenest cities in North America, it is also known for a very active lifestyle. But along with the outdoor lifestyle, Denver has a vibrant restaurant and craft brewery scene, with more beer brewed within its limits than anywhere else in the U.S. Out of 384 breweries in the state, approximately 60 are in Denver. Despite the dominance of breweries in Denver, there is also one urban winery. Parsons got investors in 2008, and in 2009 he started producing wine in kegs. A tap system is more efficient than bottles -- a keg provides 135 five-ounce pours, each as fresh as the next. Kegs can also be re-used. Then in 2010, after always wanting to put wine in a can, Parsons partnered with the largest aluminum can company in world. They created a lining to put in the aluminum so that no taste was imparted to the wine. He launched the canned wine at Aspen Food and Wine in 2011. The name Infinite Monkey Theorem comes from an old mathematical theory in which anything and everything is possible. The logo follows suit with the image of a monkey typing -- “anything is possible.” With Infinite Monkey Theorem, Parsons is breaking barriers by making wine relevant, fun and accessible. They offer four different wines in can, eight different wines in keg and nine different bottles of vin. From the red wines in bottle, we tried both the 2014 Cabernet Franc, which is made from grapes that are 60 percent from Palisade, Colorado and 40 percent from Lodi, California. The Cab Franc carried aromas of jalapenos, and the 2013 Syrah, which comes from Colorado, touts notes of cola. After enjoying wines from the bottle, we tasted the four wines from a can. There’s a Chardonnay, rose of Syrah, a Merlot and a Moscato. I was skeptical at first about wines in a can, but Infinite Monkey Theorem Wines knows how to do it. The canned wines are slightly carbonated, which helps keep the aluminum’s integrity so it won’t explode or implode. These wines are perfect for pool parties, ski trips, rafting, picnics and just about any occasion. And now they also offer a dry, hopped pear cider in a can. For a winery that started with $272,000, today they are producing 100,000 cans, 9,000 kegs and 8,000 nine-liter cases per year. Infinite Monkey Theorem canned wine is distributed in 37 states and can be found in Whole Foods, as well as on Frontier Airlines as the in-flight wine. The wines can also be enjoyed in Denver at their “tap room” -- not a tasting room -- located in front of the 15,000-square-foot winery in the vibrantly growing River North Arts District (RiNO) in Denver. 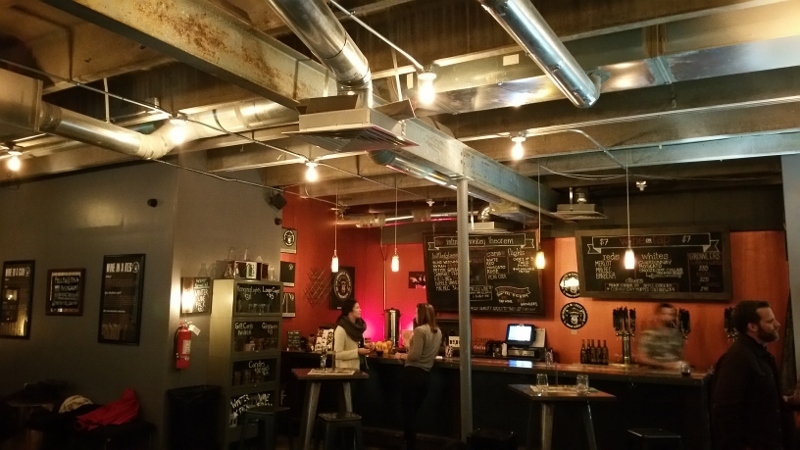 The tap room is a large, warm space filled with couches, tables and stools and has a bar that offers wine on tap. It is a perfect spot to relax with friends for the night, but if you want to learn more and see the winery first-hand, tours are available too. The city of Denver is manageable and accessible, but a central place to stay is in LoDo (Lower Denver). Located in the middle of downtown Denver, LoDo is Denver’s oldest neighborhood. It is where the Pepsi Center, Elitch Gardens, Coors Field, Larimar Square and Union Station are located. It is also where Springhill Suites Downtown Denver, my base for my short visit, is located. From this hotel I was less than two miles from Infinite Monkey Theorem. Aside from its centrality, the boutique suites and free wi-fi access throughout the hotel (a business traveler’s dream), what made Springhill Suites all the more attractive is the fact that the hotel is the first LEED Gold® hotel in Denver. The hotel is also connected to Metropolitan State University located across the street. As a guest at the hotel, there is no restaurant onsite, but head across the street to the University’s restaurant, Degree, where they are training the next set of hospitality leaders in Colorado.